Habbo Hotel is a virtual hotel environment where players can socialise with each other using customized avatars called Habbos. The virtual environment features Public Rooms which are accessible to all players; and Guest Rooms, which are private user-created rooms. The service began in 2000 and has expanded to include 11 online communities (or "hotels"), with users in over 150 countries. Credits, (also called Coins on some hotels) are the main currency for Habbo Hotels. They can also be redeemed into Exchange, which displays the Credits as an item of virtual furniture; the furniture can then be traded among users, and redeemed back into Credits. 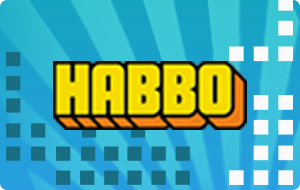 Users can join Habbo Club (HC), which is a premium subscription purchased using Credits. Features of Habbo Club membership include a badge, new selections for a player's avatar, new room designs, and a free piece of furni exclusive to club members every month. As of August 2011, over 230 million avatars have been registered. There are an average 10 million unique visitors monthly. Habbo's main feature is the "Hotel", and consists of a client made using Adobe Flash technologies. The Hotel can be accessed by logged-in users via the Habbo Homepage. When a user accesses the Hotel they are brought to a screen colloquially known as Hotel View. From this screen, members can contact one another via the Habbo Chat, which acts as the main form of communication throughout all areas of the Hotel, and use the Navigator to navigate their way to a chat room. Originally, communication was conducted through the Habbo Console, which was recently replaced by Habbo Chat and by Habbo Mail, which is accessible via the Habbo Homepage. Public Rooms are rooms which are available to all members. They often depict scenes such as restaurants, cinemas, and dance clubs. Most Public Rooms contain automated robots which shout pre-recorded messages and can give members drinks and food items. Public rooms are designed by Sulake and are not customizable by users. Guest Rooms are special rooms which users can customize to endless lengths with Habbo Furni, wallpaper and floor patterns, which can be purchased with credits. Users can also choose from a range of room templates that determine what shape the room is. Guest rooms can be created by any member and can be locked to allow access only to specific users or password holder. Many users create their own games in their guest rooms, which give furniture or coins as a prize. These rooms are categorized on the navigator in many categories such as "Trading", "Parties", and "Role Playing". Virtual pets can be bought and kept in Guest rooms. Users can interact with the pets, which will obey certain commands as long as they are kept happy and fed. Users can access games made by Habbo to earn achievement badges and furniture prizes.